Why on earth would socialists support the neoliberal, undemocratic EU? The EU is a deeply undemocratic institution enforcing austerity and privatisation on its member states. In what strange world is this a progressive institution? 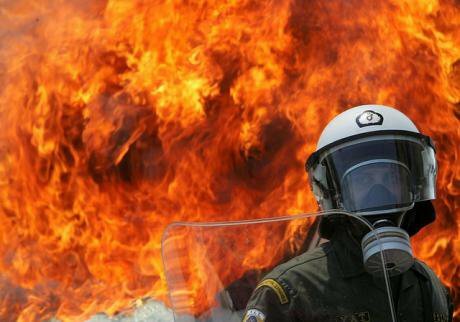 Anti-austerity riots in Greece. Flickr/PIAZZA del POPOLO. Some rights reserved. The EU is now, more than ever, defined by its fanatical commitment to the rule of market forces, privatisation and the rolling back of the power of national governments. This ideology of neoliberalism explains the EU’s enthusiasm for the politics of austerity, which it has imposed throughout the continent as a response to the global financial crisis. But, just as austerity has failed in the UK, it has failed throughout the EU. Twenty-three million are unemployed thanks to EU-driven austerity. Living standards have collapsed thanks to EU-driven austerity. Far-right groups have gained strength thanks to EU-driven austerity. Renewed tensions have emerged between nation states thanks to EU-driven austerity. Public services have been decimated thanks to EU-driven austerity. When economies crashed, the EU’s answer was to impose more crippling austerity as part of any bailout condition. This served only to generate deeper impoverishment and social tensions. The EU’s commitment to neoliberalism means its laws are designed to encourage private enterprise at the expense of public ownership. As a result, we have seen an accelerating transfer of ownership and control of industry from elected governments to big corporations. Trade unionists and socialists make key demands over public ownership. But many of these demands would actually be prohibited under EU law. So, for example, renationalising the railways is forbidden, as EU law compels member states to open up their railway systems to the market. And the controversial Transatlantic Trade and Investment Partnership (TTIP) deal, which would open up public services, including the NHS, to wholesale privatisation, should be reason enough for anyone who cares about these things to support a Leave vote. The recent Tata steel crisis threw into sharp relief the pernicious effects of EU law on ownership. Understandably, many trade union leaders and some Labour MPs demanded the government nationalise the Port Talbot steelworks. But missing from their demands was any recognition that such a move would undoubtedly have breached EU law, which prohibits member states from using public money to rescue failing steelmakers. EU competition rules dictate that these things must be left to market forces instead. Indeed, earlier this year, the EU took punitive action against the Belgian and Italian governments after they used public funds in an attempt to rescue steelmakers in trouble. It is therefore probable that in the case of the government’s intervention on steel the EU will, for reasons of expediency, choose to look the other way for a few weeks. But we should be in no doubt at all that EU law is ultimately framed to benefit the privateers and to discourage public ownership of industry, even in cases where entire communities and thousands of jobs are at risk. Trade unionists and socialists stand for investment in industry as a means to achieving full employment and economic growth. Investment is particularly important in tough times, as it stimulates economic activity, increases tax revenues and aids recovery. Austerity does the precise opposite. After the global financial crisis struck almost a decade ago, EU-driven austerity prevented many countries escaping recession. Crucially, EU rules, under the Stability and Growth Pact, prohibit any member state from running a budget deficit of more than three per cent of GDP. This means that any government wishing to borrow to invest as a means to boost the economy faces rigid constraints. This, in turn, means that recessions and austerity are prolonged. The doctrines of John Maynard Keynes, which for so long after the Second World War provided the foundation of economic policy for left of centre governments, are effectively illegal inside the EU. One of the primary arguments deployed by some on the Left against withdrawal from the EU, is the danger of what is termed a ‘Right-led exit’ – meaning a withdrawal undertaken on the terms of Tory right-wingers and Ukip. But this argument is flawed, because it appears to completely discount the fact that the Remain campaign itself is dominated by the political Right. Just consider, David Cameron, George Osborne, the Tory government, the CBI, the IMF, the Bank of England, the wider banking industry and big corporations are all fighting desperately to remain inside the EU. They do so in the knowledge that a ‘remain’ vote would settle the issue for at least another generation, and with the consequence that for all that time we would be locked into an institution that is explicitly pro-neoliberal and anti-socialist. Add to that the restrictions of EU law that would constrain any incoming Labour government, and with the EU heading in an ever-more anti-democratic direction, it is obvious that a ‘Right-led Remain’ poses a much greater threat to workers than any ‘Right-led Brexit’. There is also a view among some on the Left, particularly in the trade unions, that while the EU’s enthusiasm for neoliberalism and austerity is an inescapable truth, our interests are best served by staying inside it because it has delivered some rights for workers. They claim that these rights would be threatened by a withdrawal from the EU. In truth, the picture is far more complex than that. Many of the main planks of workplace legislation giving benefits to UK workers – such as on health and safety, equal pay, the minimum wage and trade union recognition – were won through the UK parliament as a result of trade union campaigning. They had little or nothing to do with the EU. The image of the EU as some great protector of workers is hard to reconcile when considering that, in keeping with its neoliberal objectives, it promotes zero-hours contracts under flexible labour market rules and deliberately weakened collective bargaining arrangements in the bailout countries. And let’s not forget that the most fundamental workers’ right of all – the right to work – has been denied to millions as a direct result of austerity-induced mass unemployment. Worryingly, in two landmark legal cases – Viking and Laval – the European Court of Justice ruled that collective action by a trade union could be deemed illegal if it is taken to prevent an employer setting-up in, or posting workers to, another member state, for example in an attempt to pay cheaper wages. And while as trade unionists we must oppose attacks on immigrants, we must also recognise that the EU’s policy of open borders has given rise to an explosion of cheap labour and contributed to the undercutting of wages (a reason why the policy enjoys the support of big business), caused real social tensions, placed public services under pressure, and fuelled the rise of far-right groups. The truth is that unrestricted movement of labour has the capacity to cause social and economic disruption just as much as the unrestricted movement of capital. None of this is to blame immigrants personally. Nor it is to absolve governments or unscrupulous employers for their actions. It is simply to recognise the reality that EU-driven mass migration has impacted on the lives of workers in a real and tangible way. In the final analysis, any perceived benefits of EU membership in terms of workers’ rights must be set within the context of the huge setbacks suffered by workers as a result of EU-inspired austerity. Ultimately, it is a question of what the EU is defined by. Is it defined by its support for trade unions and workers’ rights? Or is it defined by its zeal for neoliberalism, austerity and cuts? It is surely the latter. We should no more look upon the neoliberal EU as a friend of workers because it gave us the Working Time Directive than we should look upon the neoliberal Tory government in the same way because it gave us the ‘living wage’. And what of the small matter of democracy? The EU parliament has no right to initiate or repeal legislation. Instead, all legislation is generated by the unelected EU commission. The EU parliament is effectively a rubber-stamping body for the commission – a fig leaf for democracy. Throughout the history of the EU, there has been a gradual but unrelenting transfer of power away from elected governments and towards unelected bureaucrats and big corporations. This is an insult to all those who fought for the vote and the principle that ordinary people must be allowed to hold their rulers to account. In Greece last year, the people voted decisively and explicitly against austerity in a national referendum. But the EU establishment forced it on them anyway in brutal manner. To avoid further bailouts, the EU is now demanding deeper economic integration between member states. This can happen only if there is closer political union. This, in turn, would mean even more power being transferred from national governments to unelected bureaucrats and bankers. The EU superstate is no longer a distant threat; it is a growing reality. That's why there is no status quo in this debate. The question of 'stay as we are' or 'leave' is actually one of 'in even deeper' or 'leave'. Some argue that we need to be inside the EU in order to reform it. Such talk is idle. Government after government has been saying the same thing for years, even decades. But in reality the EU is unreformable. Indeed, it has been designed to preclude serious reform. The EU commission is unelected and unaccountable. There is no democratic mechanism by which it can be reformed. The UK government recently undertook a ‘renegotiation’ of EU membership in an attempt to achieve serious reform. It threatened to walk away from the EU if it didn’t get its way. But even under this nuclear threat, the EU offered very little in the talks. If the EU isn’t prepared to reform under threat of withdrawal by a significant member state, when would it be? Neoliberalism and unaccountability are locked into the EU through its treaties and directives. To reform the EU from being a neoliberal, anti-democratic institution into being a progressive, socialist, democratic one would mean that all member states must agree simultaneously to unpick all of this. There is zero chance of that happening. Those of us on the Left must seek to build solidarity between workers in different countries. But we do not have to be locked into a highly-bureaucratic, anti-democratic, anti-socialist, supranational institution to achieve that. A Leave vote would not of course put an end to the attacks being suffered by UK workers in the name of austerity. We would still face at home a Tory government hell-bent on making workers pay for the economic crisis. But the EU referendum gives us a clear opportunity to kick away one of the pillars of austerity which has caused so much suffering to workers. We may then concentrate our efforts on defeating the enemy at home and electing a Labour government committed to a radical programme of investment, redistribution of wealth, full employment, defending public services, improving workers’ rights and reinvigorating our democracy. The first step to achieving that is getting out of the EU.